What is now the Town Library Society in Saffron Walden was founded in 1832 with the aims of "The promotion and diffusion of useful and scientific knowledge. First by circulating books and periodicals amongst the members and subscribers, and after such circulation, to preserve them as a library for the use of the Society. Secondly, by the production of papers on miscellaneous subjects previously agreed by the members, and lastly as soon as practicable, by occasional public lectures". At first the founders had difficulty in choosing a name for their society. 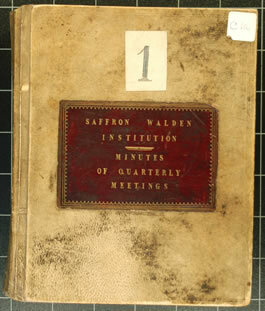 It was initially called the Working Men's Reading and Improvement Society, then the Philosophical Book Society, finally settling down as the Saffron Walden Literary and Scientific Institute.